So the set in the second in the vases theme. The first is Varied Vases which was brought out accompanied by the vase builder punch, then came Vibrant vase. All the work together to create a huuuge combination of card possibilities. Mine is just one variation. So I have not one vase her rather I used one of the flower bunch stamps to create a pretty dual border effect. I added Calypso coral and granny apple green to the stamp using my markers. Then added extra colour using my blender pens. The die for the sentiment comes from stitched labels... my all time favourite ! 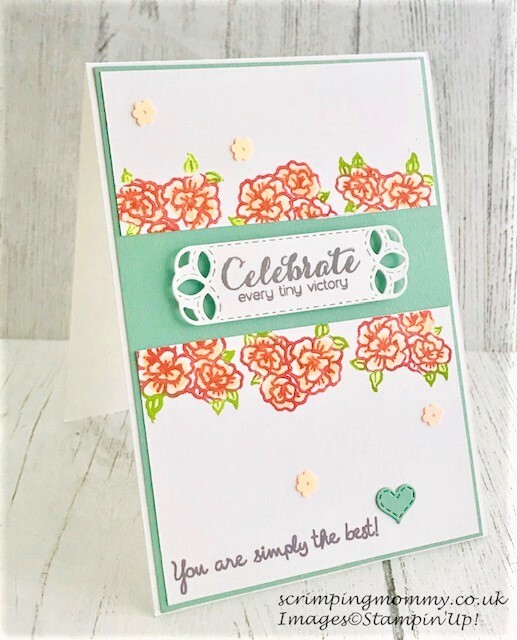 Tiny iridescent flower sequins dotted about add a subtle sparkle to finish the card off. Simple but pretty. 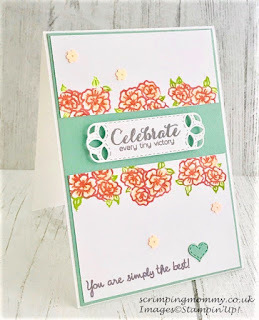 I hope you enjoyed this pretty card and will have a closer look at some of your stamp sets to find alternative used for them.